This is something a bit different as I don’t usually post recipes but I was recently asked by Stocking Fillers if I could share a Christmas recipe with a summer twist. They are running lots of giveaways over the first two weeks of this month to celebrate Christmas in August. I had a little think and the first thing that sprang to my mind was a summer version of a Yule log. I wanted to use whipped cream and berries instead of the chocolate and decorate with flowers instead of mistletoe. I also added a mashed banana into the sponge. 1. Preheat the oven to 200º C and line a shallow baking tray with some baking paper. I had mine coming up over all the sides too so it didn’t stick to them. 2. Start by whisking your eggs and honey / maple syrup or sugar together. Then add the mashed banana, vanilla essence and flour before whisking again. The measurements can vary slightly depending on the size of your eggs so try and get it to a runnier consistency than normal cake. 3. Pour the mixture on to the baking tray, mine was about 1 cm thick and place in the oven for about 8 minutes, take it out when it springs back up and pushing your finger down on it. 4. Lift from the baking tray and place upside down on another piece of baking paper sprinkled in icing sugar. Peel off the bottom layer of baking paper before replacing with a new sheet and then roll the cake up. 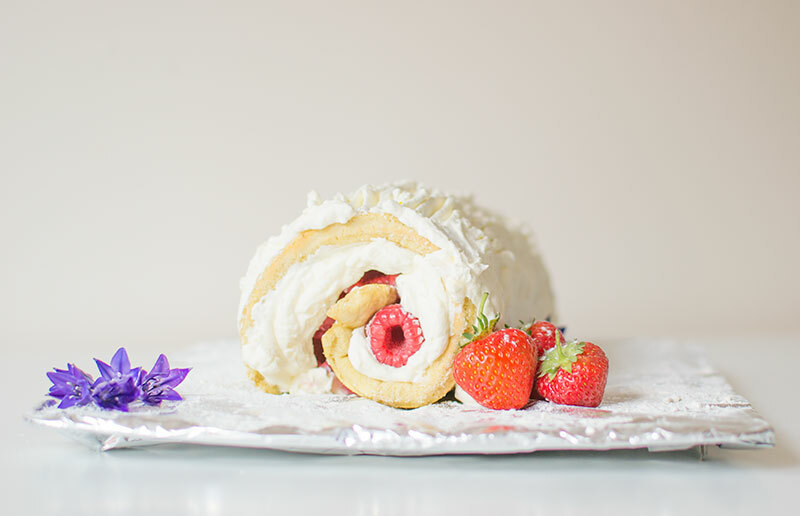 Place the rolled cake on a cooling rack to cool down. 5. In the mean time you can pour your whipping cream into a bowl and start whisking it. 6. When the cake is nearly cool carefully unroll it and pull the top layer of baking paper off before filling with the cream, jam and fruit. I forgot to add the jam to mine but a thin layer would have made it a bit sweeter so I will definitely add it next time. Don’t go too mad on the fruit either as it will make it hard to roll. 7. When you have added your filling carefully roll it back up removing the bottom layer of baking paper as you go. 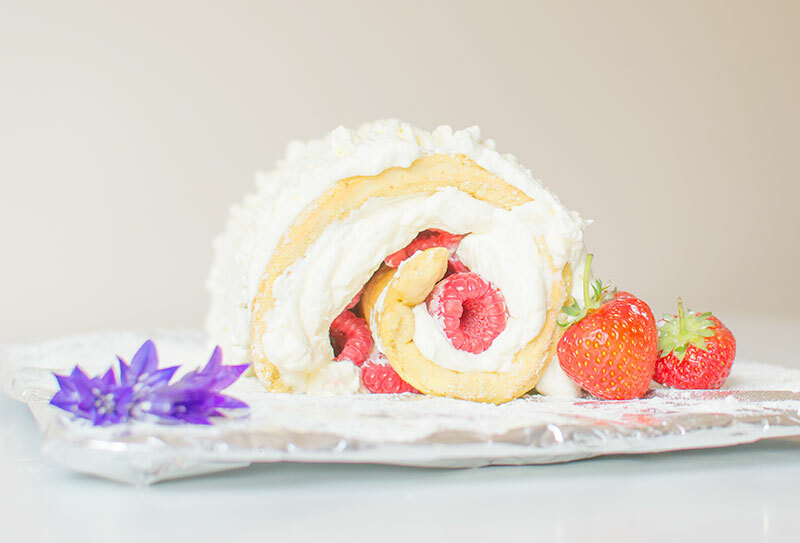 Place the rolled cake on the board / plate of your choice. 8. Spoon the remaining whipped cream onto the cake and smooth over the top, then lightly run a fork down it to give the lined effect that you would find on a Christmas Log. 9. Lastly place some more fruit around the outside, decorate with flowers and sprinkle it all with icing sugar. How to Get the Family Enjoying Vegetables!